Hospitals are community hubs, major regional employers and enduring symbols of community pride. The history of most U.S. health systems goes back decades, with deep roots in their communities and broader regional influence. So when a healthcare system either decides to go to a master brand strategy, or when two merging healthcare organizations decide to change the name of a hospital system as a result of the merger, the amount of resistance by patients and the communities at large is always a major concern. If poorly done, communities in which healthcare providers operate continue to resist, long after the rebranding is complete. Limiting resistance is the decisive factor for transferring trust from the old brand to the new brand. So how can you convert your brand while minimizing the risks? It is often essential to observe a transition period by linking the two brands, with the change being gradual. The two brands are co-marketed for a period of time (generally 6 to 24 months) before the old brand is completely phased out of the branding strategy and marketing execution. The pace of this transition and how it is handled is often the key to success (click here for a more in-depth discussion of post-merger brand strategies options). In our experience, change management often works best and resistance decreases if the change is gradual, well communicated, and if stakeholders can see a clear benefit to it. With brand change, trust must be transferred from one brand to another. Once patients have trust in a brand, they will also be loyal. It is, therefore, a question of doing everything possible to ensure that patients and communities adopt a positive attitude and opinion towards the new healthcare brand. If done too quickly, a rebrand weakens the relationship with patients and the community. It often leads (at least temporarily) to the loss of a familiar landmark or touchstone, which then generates confusion and resistance to change. The risk is that patients and the community not yet trusting the new brand, may be more open to competitor offerings. The graphic below is a hypothetical illustration of the situation being faced. The system was originally fragmented in terms of its branding with a lack of recognition and awareness in each of the individual markets of being part of a larger health system. A move to a master brand strategy was seen as the solution to this predicament. Given each market’s unique situation, the level of resistance combined with the level of competitiveness and market opportunity drove the decision as to whether the brand change would move directly from the current state to the desired brand end-state; or whether an interim 12 to 24-month period of brand transition would be used before moving to the final master brand. 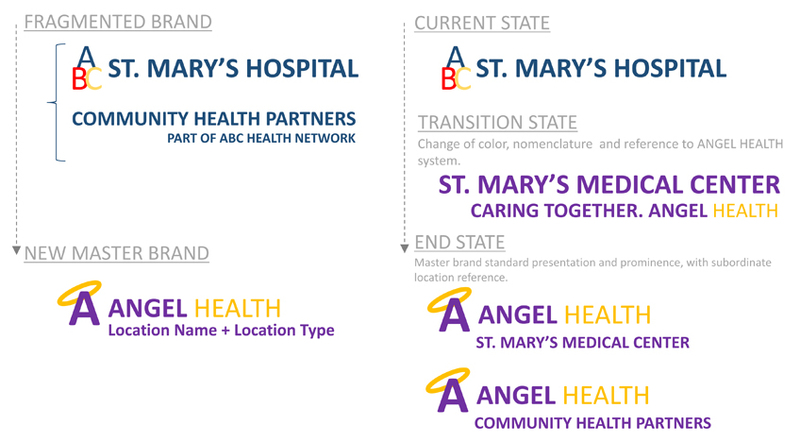 In the end, the goal of the rebrand was to bring about a consistent master brand strategy across the entire system with a designated nomenclature for naming medical centers, institutes, service lines, programs, physician networks etc. The rebranding was to reflect a shift in the health system’s governance structure as well as its strategy to make operational changes, expand key service line capabilities and leverage resources and expertise across the organization as a broader strategy for the future. By taking a multi-year, measured approach to the pace of brand conversion, using a transitional versus direct brand conversion approach based on local market needs and characteristics, the initiative achieved both its strategic and fiscal goals. 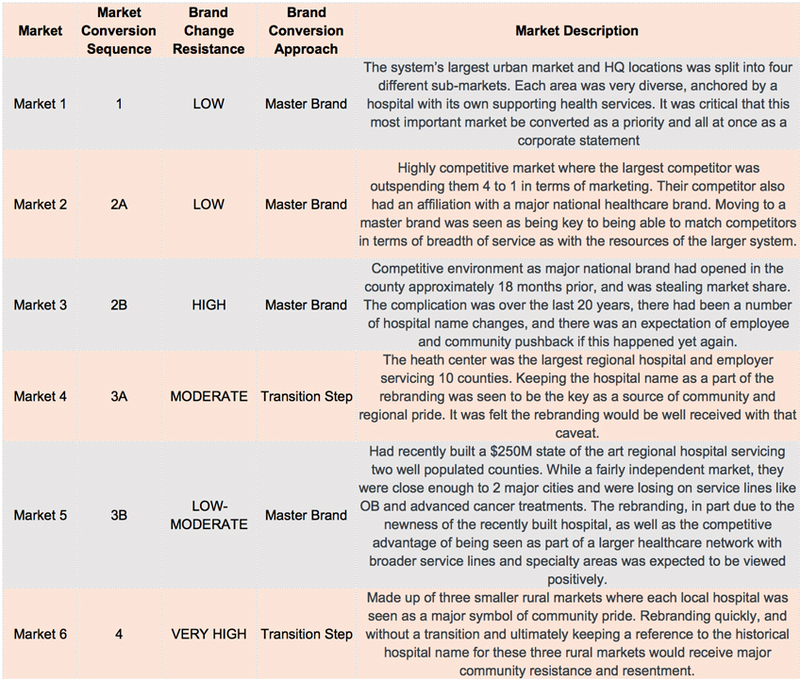 Does your healthcare organization have a plan for brand transition? How would these strategies have impacted your last transition? Let us know in the comments below and subscribe to receive the latest Shikatani Lacroix insights in your inbox.